Beautiful house in Caleta de Vélez. 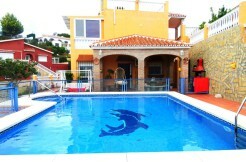 Has a total land of 512m2 and the house 180m2. The house has 2 stories. On the main floor there are 3 bedrooms, 1 bathroom, a living room with a chimeney and an independent kitchen with access to a terrace. The basemente has an apartment with 3 double bedrooms, 2 bathrooms, an independent kitchen, a lounge with access to the terrace and the garden. The house has natural gas and a total of 6 bedrooms and 3 bathrooms. 2V-104-C 2 BEDROOM FLAT CLOSE TO THE BEACH !! 3V-152 3 BEDROOM APARTMENT IN VÉLEZ-MÁLAGA.